Figure from Baars & Franklin (2003): How conscious experience and working memory interact. 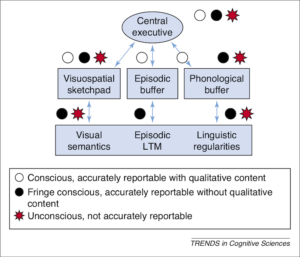 Trends in Cognitive Science. Players in a tabletop roleplaying game themselves constitute some of the hardware that makes up the game. This is a substantial part of what distinguishes tabletop roleplaying from other mediums and activities. It seems to me that designers and players too rarely consider directly the constraints or affordances of these human details, despite the centrality of human capabilities to the activity. Consider theater of the mind, where players collectively maintain the details of an immediate fictional situation through conversation. Collectively maintaining a dynamic situation is complex. People have limited thinking powers, so theater of the mind constrains the complexity of potential fictional situations. In terms of benefits, conversationally maintaining a collectively shared fictional reality allows imaginative flexibility, compared to more concrete tactical representations, so theater of the mind affords continuous creative reinterpretation. The entire theater of the mind needs to fit in the working memories of current players. This is a small workspace. Experimentally, just rehearsing a phone number can effectively induce cognitive load. Even assuming some division of labor between players, such as player one tracking lava locations and player two tracking the anger expressed by goblins, the amount of information available is highly constrained. Further, in practice, such division of labor is mostly impractical, due to the nature of the task, which is to collectively keep as much detail alive continually for as many players as possible. This task is orders of magnitude more complex than, say, watching a Peter Jackson action scene—and there is a lot of chaos in a Peter Jackson action scene. Unlike competitive games that involve shared imagination, such as chess, the success of the endeavor is collective. One player, or a subset of players, can take on more responsibility for coordinating communication and resolving ambiguity. Traditionally, this will be the referee/dungeon master. However, the activity itself, the actual unfolding of play, lives or dies only as it persists richly in the experience of all participating players. In this respect, roleplaying ability involves facilitating collective shared experience—this goes for players just as much as referees—rather than procedural knowledge extracted from rulebooks. Success remains collective at the level of maintaining shared fictional understanding even if the game has competitive elements, such as constructing the most effective character build or keeping your character alive the longest. Unlike games of physical sport that similarly rely on shared abilities to successfully realize the performed activity, most roleplaying game designers and players seem unaware of how their own abilities and limitations shape and constrain the experienced game. Due to these constraints and affordances, hybrid practices partway between the extremes of purely conversational theater of the mind and highly structured battle grid seem to offer the greatest potential. Building too much structure out explicitly risks constraining imagination. However, expecting everyone to be able to track everything in their head is unrealistic, and is probably part of the reason why play sometimes devolves into sequences of rule following activity with low player involvement and minimal imaginative texture. Anyone with a modicum of roleplaying experience can probably recall examples of play degrading in this way. 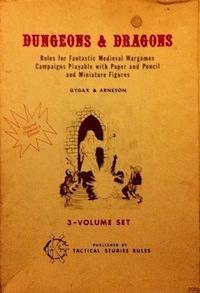 Rather than thinking about rules and techniques as methods to attain a desired distribution of outcomes—for example, the dungeon turn in B/X D&D or the 2d6 +stat roll in Apocalypse engine games—or ways to ensure particular kinds of mechanical progressions—such as XP incentive systems in D&D of any edition or baking genre into procedures for narrative games—perhaps it is worth thinking about the purpose of systems or techniques as keeping the game alive in the minds of players, where it actually exists. This post has been brought to you by pages 10 and 11 of Silent Titans—which has useful thoughts about evoking memorable environments and situations from the perspective of the referee—and Scrap’s post about moving beyond fictional positioning as an abstract ideal. This entry was posted in Speculations on April 16, 2019 by Necropraxis. One way I manage it is to prioritise the indexicality of information in decision-making. That is, rather than needing to keep the details of the entire situation in one’s working memory for a sustained period of time, I try to set it up so that we quickly review information when time comes for a decision, in order of relevance and importance to the decision to be made. It’s not perfect, and it requires a fair bit of practice to do well, but it seems to mitigate some of the more severe instances of cognitive overload. I’m curious how the players might naturally parse the information amongst themselves based on the type of character they are playing? Might those playing “wise” types (wizards, clerics, shamans, etc) focus on historical aspects? Or those playing “cunning” types (thieves, specialists, etc) focusing on fine detail on a smaller scale? Just some random thought-reactions I was having while reading your excellent analysis. I find this a huge problem and have never found a good solution that survives the stress and chaos of the moment of play. The best work arounds I have involve using white board programs, and maps that can be referred to when tactical situations arise, but which don’t constrain TOM prior to that. But it’s super kludgy and, if I’m being honest, doesn’t really work. This is the invisible speedbump in all ttrpgs. The things my players sometimes say or ask *two minutes* after I’ve described the scene have really driven home how fraught theater-of-the-mind can be. I bring a notepad to my home games to sketch out small maps but as Ben said above it only helps sometimes, slightly.